The DELTA SCREEN is a spiral screen fastened around a perforated PVC pipe; this special construction has been studied to offer the advantages of the spiral screen at a reasonable price. The pipe used for producing the DELTA SCREEN is non-toxic and suitable for drinking water use, it is male/female threaded and its dimensions are: diameter from 125 to 400 mm and length from 1 to 4 m.
The pipe wall thickness depends on the depth of installation of the DELTA SCREEN. 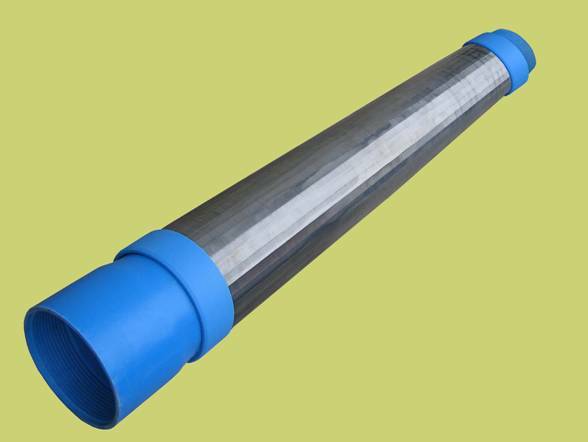 All over the usable length, the pipe has 10 mm diameter round holes (78, 5 mm2 of open area for each hole). The holes are at a distance of 10 mm one to another in both directions: horizontal and vertical. Outside this tubular PVC pipe based structure is fixed an INOX steel screen, spiral type. Unlike the other steel screens, the spiral screen has a special construction that is designed to provide the biggest possible open area and a very high yield. The spiral screen is made with 304 or 316 INOX steel rods which have round section and different lengths from 1 to 4 m. The rods are placed according to the generatrices of a cylinder. Once the rods are arranged in this way, a 304 or 316 INOX steel wire is wrapped around them for the whole rods length. The wire is “V” shaped and has its vertex touching the rods, while the base is turned outward. Each point of contact between the wire and the rods is welded with an automatic welding machine. The distance between one coil and the other is the screen slot and can be adjusted according the customer needs. The slots that are formed in this way have all the same width and dimension and are continuous. It is exactly this feature that give to the spiral screen a bigger open area compared to the other types of screen, while the wire shape and position (with the base outward and the edge inward) are for avoiding clogging and making pumping operations easier and cheaper. ensure a remarkable yield as well as making the cleaning of the well easier and faster.